We went up to the cabin last weekend for a non-snowboard-team trip to the slopes. Weather on Saturday was lovely; possibly the best weekend skiing we have had this year. Overnight it snowed about 6" and we woke to that soft quietness that means snow. The cabin has a metal roof, so the transition from rain (very loud) to snow is rather noticeable. While we were eating breakfast we noticed that we were not the only ones eating. 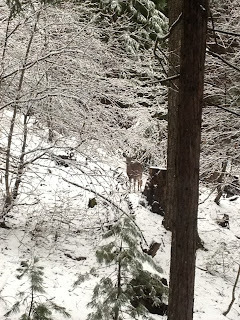 Three deer were noshing away on the new leaves of the dogwood trees. We have seen three deer several times over the winter, so I wonder if it's a 'local family'. Anyway - they hung around for a long time before slipping away into the trees. 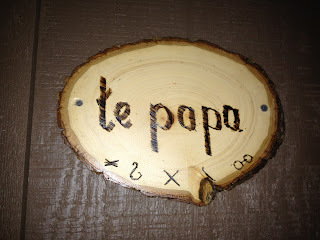 Nigel came back from New Zealand in November with the perfect name for our cabin: "Te Papa" is the name of the Museum of New Zealand in Wellington and means 'our place'. I decided that the cabin needed an actual name plate so bought a cheap pyrography kit from Amazon and had a go at making one myself. As well as the cabin name it also has symbols for us all. From left to right: whiskers for Charlotte, a fish hook for Fin, knitting needles for me, a downhill snowboard for Adam, and bike wheels for Nigel. It was fun to do, and not too difficult, although I found straight lines easier than curved ones. I managed to make this sign without setting anything on fire or burning myself so I think that counts as a 'win'. I varnished the plaque with a matte varnish and it's now mounted by the front door. I can't think of anything else I need a pyrography kit for now - anyone need a wooden plaque?? 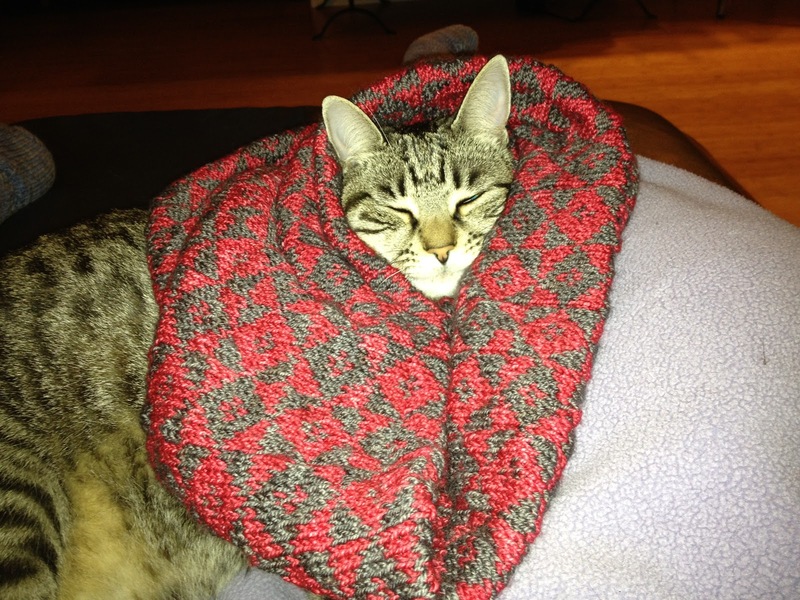 I saw this cowl on Ravelry and immediately had to cast on. Its the Toast wrap pattern Ravelry Link. I wanted a red and grey combination but had quite specific ideas about the grey so I visited my local wool shop: Yarndogs, and came away with a skein of Dream in Colour Smooshy in Cocoa Kiss, and a skein of Madeline Tosh sock in Scarlet. 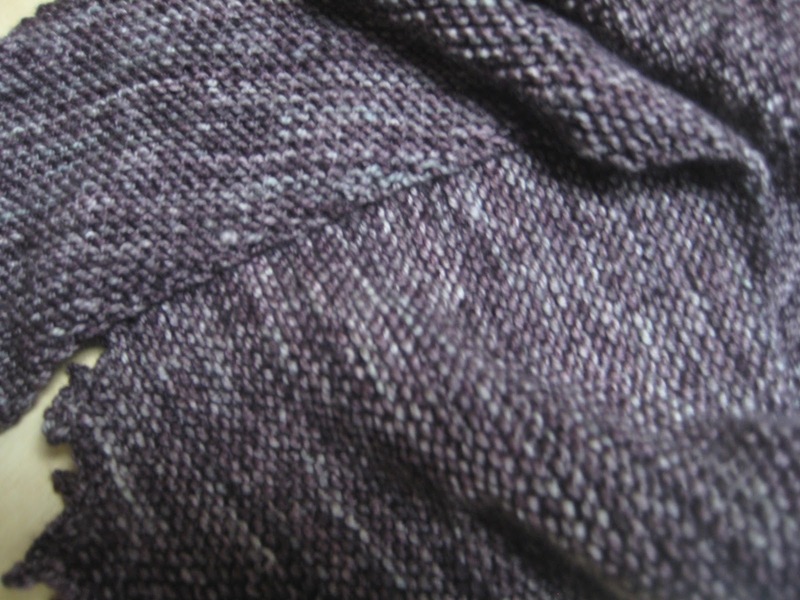 Both yarns were really nice to knit with and gave a good definition of the pattern. The pattern itself was easy enough to motor through, but interesting enough to want to keep knitting. I was really pleased with the result - my feline model on the other hand was less thrilled with it as a garment and liked it more as bedding. 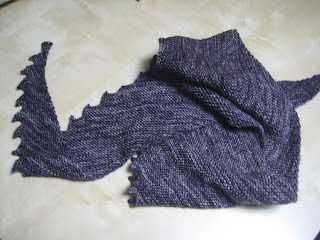 So, I have been spinning, knitting, and weaving but none of it has made it to the blog for a while. I also have not even taken photographs of some of the things that have been and gone! This one I kept for myself. 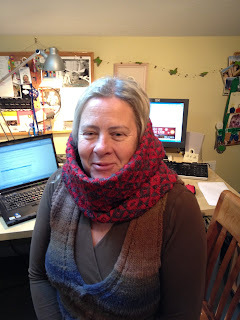 It's the Hitchhiker Scarf Ravelry link knitted in Madeline Tosh Pashmina. Pashmina is a blend of 75/15/10 Merino/Silk/Cashmere and was a lovely to knit as it sounds. The colour is Kelp. I only did 36 points rather than the recommended 42 and have about 3 yards of yarn left. The yarn is a lovely, gently variegated brown and has been very wearable just as a regular scarf. More useful really than the lace shawls I like to knit!